A greatly improved three bedroom link-detached family home further enhanced by a conservatory and benefitting from a re-fitted kitchen, utility room and family bathroom. The property is the largest design of three bedroom properties on the development and offers accommodation approaching 1400 square feet. The improvements are too many to mention so an internal inspection comes highly recommended. EPC Rating D - 58 SITUATION & LOCATION The accommodation comprises an Entrance Hall, Cloakroom, 15ft Re-Fitted Kitchen / Breakfast Room, 20'9 Sitting Room with log burning stove, Dining Room, Conservatory, Utility Room, Three Double Bedrooms and re-fitted Family Bathroom. There is driveway parking for two vehicles and generous front and rear gardens. ENTRANCE HALL Stairs leading to the first floor accommodation with cupboard beneath, access to loft space, travertine flooring, doors leading to all rooms. CLOAKROOM Fitted with a two piece to include a wash basin and WC. Double glazed window to the rear aspect, travertine flooring. DINING ROOM 11' 7" x 10' 4" (3.53m x 3.15m) Double glazed French doors opening to the conservatory, open plan to the kitchen. CONSERVATORY 9' 0" x 8' 7" (2.74m x 2.62m) Glazed to three sides with Patio doors opening to the rear garden, ceramic tiled floor. 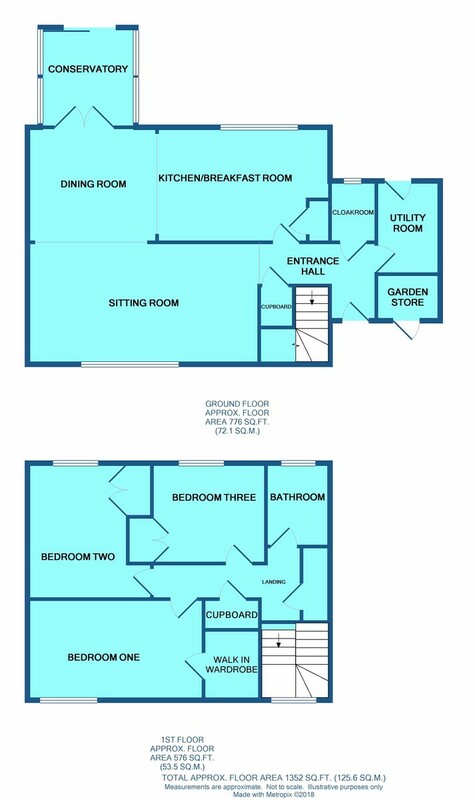 RE-FITTED KITCHEN / BREAKFAST ROOM 15' 6" x 10' 4" (4.72m x 3.15m) Comprehensively fitted with a range of hi-gloss fronted wall and base units, work surfaces and complementary tiling. Space for range style oven with extractor canopy above, integrated appliances include a dishwasher, space for American Fridge / Freezer, double glazed window to the rear window aspect, travertine flooring. UTILITY ROOM 8' 4" x 5' 8" (2.54m x 1.73m) Re-fitted with a range of high gloss front wall and base units, sink unit, plumbing for washing machine and tumble drier, double glazed door leading to the rear garden, travertine flooring. LANDING Airing cupboard housing hot water cylinder, access to loft space, further storage cupboard, doors leading to all rooms. BEDROOM ONE 15' 9" x 9' 0" (4.8m x 2.74m) Double glazed window to the front aspect, door leading to a large walk in wardrobe. BEDROOM TWO 12' 2" x 11' 2" Max (3.71m x 3.4m) Double glazed window to the rear aspect, built in double wardrobe cupboard. BEDROOM THREE 10' 2" x 9' 4" (3.1m x 2.84m) Double glazed window to rear aspect, double built in wardrobe cupboard. RE-FITTED FAMILY BATHROOM Fitted with a three piece suite to include a panel enclosed bath with shower attachment and glass screen, wash basin and WC. Double glazed window to the rear aspect, ceramic tiled floor. OUTSIDE To the front the garden is predominantly laid to lawn with a gravel driveway providing parking for two vehicles and leads to the front entrance door. Gated access to the rear garden.